Evernote is obsessed with organization. Just as the company’s note-taking app helps workers across industries keep all their virtual odds and ends in one place, its Silicon Valley headquarters provides valued structure and workflow to its 336 employees. 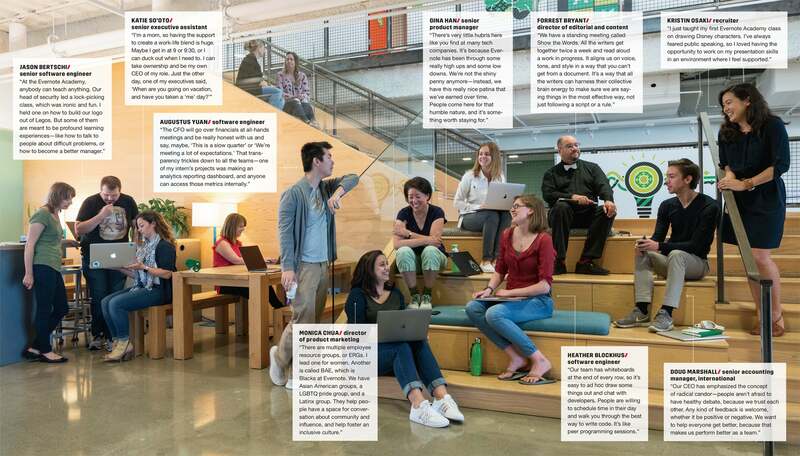 An open floor plan is peppered with collaborative workstations for coders, quiet rooms for content creators and an open stairwell that encourages cross-departmental conversations. Multiple resource groups and social organizations host meetings and events throughout the calendar year, and the Evernote Academy offers a rotating selection of classes -- designed and taught by its employees -- on everything from leadership to Lego building.